I have a question, but first let's see Monaka. "When you play this card, if you do not have any Battle Cards other than this card in play, choose up to 1 of your opponent's Battle Cards. Place that card on top of the opponent's deck, and all cards that were under it in the Drop Area." 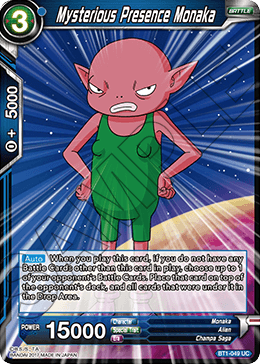 If I understand correctly, Monaka throws all enemy deck to Drop Area, excpt one opponent's Battle Card? Is he not too strong? Because in the third turn, enemy haven't deck! No, it means that if this is the only card on your side of the field you can bounce one of your opponent's cards to the top of their deck. So you have to have an empty field to use this effect, therefore, it isn't very good. The only thing it can kinda help against is a Turn 3 Cell Chain, but then you would only have two cards left in your hand so it still isn't that good. If you're genuinely asking, then that's not how it works. It means that you put that one card on top of the opponent's deck, and all the cards that were under it WHILE IT WAS ON THE FIELD are put into drop. So if your opponent has a stacked up Cell on the board, you can send all of his stack to the drop by returning him to the deck. It does not affect the opponent's deck.